"You have your brushes, you have your colours, you paint paradise, then in you go." Miss Jimmy's house, originally built in 1937, is situated on a hill overlooking the historic Lower Valley and is surrounded by 2 acres of land at the end of a quiet road. Recently renovated and lovingly restored, this 2 bedroom, 2 bath home includes a studio space with lots of natural light, an adjoining outside patio porch, and is equipped with easels and tables for your use, including a French portable easel. Miss Jimmy's is my husband's childhood home, where he was born and raised. It is named after his mother, Miss Jimmy. What you can't see is what makes this house so special. It has a history, a heart and soul. It is quiet, restful and inspiring. I am Carol Richardson, my husband is Walter Richardson. We met while living in Baltimore in 1987 and I first arrived in Anguilla on July 4th, 1987! I am an artist. We have the Estate Hope Art Studio on Crocus Hill and I make hand made quilts at present. I made my 1st sculpture, a 6' man called "Art E. Facts". It is standing in Miss Jimmy's front yard. It is made up of concrete and all sorts of tools and things we found in the yard and uncovered during the renovations. 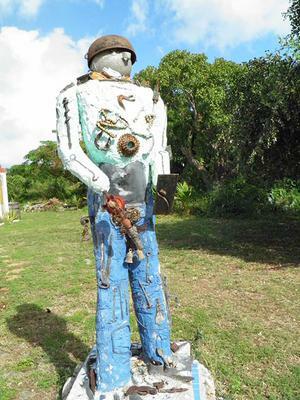 It is the strangest sculpture in all of Anguilla! Come see! Our mission is to introduce you to Anguilla through your artist eye, as our beauty is in our people, our culture and our lifestyle. And to provide artists with a comfortable working atmosphere while enjoying island life, and to know the real Anguilla, to be with and among us and contribute to our rich and growing art community. By the way, I was so impressed with Nori's web site that she inspired me to make my own, which is not easy for a computer illiterate. It is is almost done.